Mouse Blisters are little stick on squares that are supposed to make your mouse more “grippy” and eliminate strain on the hands preventing carpel tunnel syndrome, tendonitis and general hand fatigue. The Mouse Blisters are made up of the same rubber material and shape as bicycle or motorcycle hand grips, just cut into small flat squares (albeit the standard grips, not the more expensive “mushroom” grips you had on your Mongoose BMX bike with the rotor, double pegs, and mag wheels). You place them all over your mouse to provide the maximum grippiness and comfort. As silly as these may look on a mouse and really that name is a bit unfortunate (how about “mouse grippers” or “gripsies” or “ergogrippers”? pay me later for those ideas Mouse Blisters Marketing Dept. ), I think they might actually work. It will allow you to slightly alter the shape of the mouse to better fit your hand ergonomically and the raised surface of the blisters could serve to cool off your hands by allowing air inbetween your palm and the mouse. They cost $9 for a pack of 25 which should be sufficient unless you’re using some crazy gigantic mouse.
. I don't understand why everyone is hating on the name? I guess I'm clueless.. Thank you for the overall objective review, skewing on the positive side. So mind-bogglingly complex that it took over a year to develop—little rubber chunks called Mouseblisters give sweaty palms better mouse gripping capability. Apparently, this will help reduce RSI and tendonitis symptoms.
. How did it take a year? The product itself isn't complex, making it to a particular specification is. Try dealing with overseas suppliers, manufacturers, and designers. Try providing EXACT specifications to engineers and trying to source the perfect glue and rubber material. All while working a full time job. Not an easy task.
. Mouseblisters are not only for sweaty palms. In fact, my palms don't sweat, but I like the fact that it's EASIER to just hold the mouse. Period. It just feels more comfortable.
. I say it's in beta mode, because I've just created my first batch, and "maybe" I have to change a few things for the 2nd run, depending on user feedback. :: Gary_7vn: You're mostly right. But therapy and exercise does help. I can speak first hand. Changing or altering how you "do" something reduces the symptoms. These are not 'brushes', but natural rubber material designed to help reduce the amount of "stress" required to use the mouse. Every little bit helps. Yes, it took about a year to finally develop; you try working full time and designing something like this. Let me see how long it takes you. Do you even know where to begin? :: SinisterBill: Yes, the Razor is a pretty cool mouse, and if you haev absolutely no symptoms of CTS or RSI, then you don't need anything. But if you use the computer long enough, you will. And you'll be happy the mouseblister is available to relieve that stress. Talk to me when you've been using your computer for a dozen+ years and then tell me how your hands feel. :: SeraphX2: Anybody who'd rather be MORE comfortable using their computer would prefer sticking rubber things on their mouse, rather than having a clean out of the box mouse. :: OnTheCastingCouch: The MouseBlister does not make the mouse any more or less sanitary. I suppose if you have dirty grimy hands, 'stuff' will get stuck in between the ridges, but I've NEVER EXPERIENCED THAT. You can easily wash off any oil or grime w/ cleaning solution, water or rubbing alcohol. Not an issue. :: Jackrabbix: Looks like it has herpes? Hm..... I wouldn't know. Never had herpes. :: Purple Monkey: Actually, the Mouseblister was not "cheap" to develop. Cutting up motorcycle grips was my first inspiration. That's not what I'm offering to the public however. Although, theoretically, you could do that. Motorcycle grips cost more than $9, and it would take some time and some nasty glue to get it done. I made it simple. Just peel and stick. :: Nick is a peelin': I don't have a death grip either. And my hands don't sweat. It's not specifically designed for people who's hands sweat. :: Eruanno: In fact, the Mouseblister is very comfortable to hold. Please give it a try. :: Pope John Peeps II: I appreciate your observation, but NO, in fact the mouse becomes more comfortable and easier to use. This may be unnecessary for you NOW because you don't have any hand related stress issues. But once you do.. you'll understand what I'm talking about. Thanks. No idea on who is actually going to fork out good money for the MouseBlister as it makes your mouse look as though it is suffering from a serious case of blisters, although the advantageous might outweigh your ego as it is touted to reduce incidence of tendonitis and carpal tunnel syndrome. We personally think that this is pretty useless, otherwise companies wouldn't sink insane amounts of money on their computer mice to create something ergonomic and yet gamer-friendly without having to plaster these unsightly blisters all over. Your thinking is rational and conventional, but incorrect. There are many things big corporations sink millions into that aren't ergonomic or efficient. For years, we all used mediocre phones until Apple came out w/ the iPhone. Microsoft sinks millions into IE, and Windows. Many would claim that there are better alternatives. Bottom line, try the product, and then tell me how you "don't" like it. The product may be useless to you because you don't have RSI/CTS symptoms "yet". But if you use the computer long enough, eventually you will... The Mouseblister helps reduce those symptoms while making it just more comfortable to use. Try the product first. It would be, perhaps, too easy to write off the Mouse Blister as a gimmicky, ridiculous idea, and so we’ll leave any value judgement up to you. Intended to prevent your mouse from slipping out of your hand, shooting off across the desk or leaving you with a twisted, withered claw, the system consists of 25 self-adhesive pads that give the peripheral a “moth-eaten armadillo” appearance. Right now you’ll have to like black, as that’s the only color on offer, but they’re planning red, blue, yellow and white versions soon. Price is $8.99 for 25 pieces, and you even get free-shipping. Anybody tempted? Thanks for the "fair" assessment, although you haven't actually tested the real thing. Their web site claims that MouseBlister can be “great for reducing CTS & Tendonitus Symptoms associated with prolonged mouse use”. Apparently it took more than a year to develop the technology to stick little bits of cut up rubber onto a mouse. 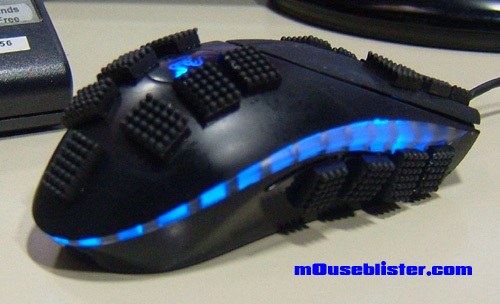 If you have trouble gripping your mouse because it’s too slippery or if you just enjoy sticking pieces of rubber all over stuff, this is the product for you. Only $8.99 (free shipping) for 25 self-adhesive mouse blisters. Color choice is wide open so long as black is your favorite. Available soon in red, blue, yellow and white. MouseBlister Reduces hand Fatigue. If you mix a years worth of research and a mouse together you come up with the MouseBlister. MouseBlisters are a bunch of rubber bits that you stick on a mouse that prevent the mouse from getting slippy. By making the mouse less slippy it reduces hand fatigue that can cause CTS and Tendonitus. The set costs $8.99 with free shipping and you get 25 self adhesive mouse blisters to stick all over your mouse. Available in red, blue, yellow and white. "A bunch of rubber bits"? The idea behind MouseBlister is that covering your mouse with little rubber blisters will reduce incidence of tendonitis and carpal tunnel syndrome, unfortunately it will also make it look like your mouse has a nasty case of warts. So which is it, pride or comfort? This mouse looks like it has a deadly case of blisters. The MouseBlister claims to reduce tendonitis and carpal tunnel syndrome, but we can’t see anybody shelling out good money to ugly up their mouse in this way. Can you say scam? Is it a mouse or a rubbery porcupine? The funny thing is that apparently it took more than a year to develop the technology to stick little bits of rubber onto a mouse. Just get an ergonomic mouse and keyboard and move on from this horror show. I don't know who wrote this article, but accusing the product of being a scam is defamatory. Blogogwogo hasn't even actually tested the product. This review is a scam. I can’t honestly count the number of mice I’ve gone through in the last 5 years or so. Sometimes I get new ones to review, other times I just buy one because I think it’ll end up being better than whatever I’m currently using. However, I still usually end up coming back to the same old Logitech wireless mouse that I’ve had for 5 years. The reason? It’s just more comfortable than the rest. Comfort should be the most important factor in a mouse, which is exactly why I would never dream of buying this MouseBlister. These strange-looking rubber bits you see attached to that perfectly good mouse are what make up the MouseBlister. They are apparently crafted from motorcycle grips to be the most comfortable things out there. The company claims that it will reduce CTS symptoms and minimize the long-term wear and tear on a person’s hand. For $9 you get 25 of those little pads. Or you could just buy a mouse that’s comfortable to use instead of padding a crappy one. I must agree with Chris is using the same mosue for over 5yrs+. That's how I am with my mouse and keyboard. I used to use an older logitech model, corded w/ a ball. I swear it was the most comfortable, best tracking mouse I had. I used to use an old Focus keyboard with a calculator for over 5yrs until both devices died on me. Then I switched to the Razor Mouse. I'd hardly call it "crappy", as stated by Chris Barr. Chris, just try it and then judge. The Mouse Blister is the new PC gadgets which reduce your hand fatigue. This latest mouse provides you unbelievable grip which using durable and soft rubber but sticky. It used same grip material which used in motorcycle handle grips. It is thicker, long lasting and it works amazing. You can easily apply in any mouse or hand held gadget to get extra grip. The new Blister Mouse reduce discomfort related with expanded mouse use, it includes Tendonitis, Carpel Tunnel and common hand fatigue. Its dimension is approx 1/2″ x 6/16″ x 3/16″. You can easily remove this mouse blister and put it anywhere in mouse where you want or need for better control with mouse. This Mouse Blister is available in only black color but soon it available in more colors such as Blue, Red, White and Yellow. The Mouse Blister is not available in stores yet, but it is available in online stores now. So, if you want to collect more information about it than call at 714-879-8882 ext 231. It is available in two authorized online store Aiyamicro.com and Wowshopper.com. Its cost is just $8.99 only w/ Free USPS Shipping. The author is jus rehashing whats on mouseblister.com At least he wasn't hating on it. ¿Cansado de que las manos sudorosas hagan que pierdas el control sobre tu mouse cuando estás a punto de fraggear a tu némesis online? ¿Deseando que tu mouse perdiera toda su comodidad y pareciera el basurero de una vulcanizadora? ¿Quieres que tu mouse se vea como si tuviera disipadores de memorias ram para decirle a todo el mundo cuán gamer es tu nuevo mouse? No esperes más, Mouse Blister tiene la solución para tí hecha con verdaderas agarras de motocicletas y viene en paquetes de 25 unidades para que le pongas a tu mouse, tu teclado, la puerta de tu auto y a los dientes de tu perro. Shame ahora, shame sha. [Sí, el producto es real, y aunque me gustan los periféricos con engomados antideslizantes creo que esta no es la mejor solución del mundo. ¿Comprarían uno ustedes? I don't speak Spanish, but I know they're spewing a lot of hate on a product they've never actually tried. Shame. Please observe the unfortunately-named Mouse Blisters, an idea that may actually work to relieve strain in your oft-used mousing hand. And if it doesn’t work, you’re only out nine bucks. What is it? Basically, a bunch of motorcycle grip material cut into small adhesive squares that you stick to your mouse wherever parts of your hand make contact. It makes the overall surface area of your mouse larger — which, as someone with big hands, I can appreciate — and keeps your mouse firmly in your grasp since, you know, computer mice are really slippery. This thing is ripe for an infomercial featuring clumsy computer users squirting mice every which way. You get 25 adhesive pads for $8.99, which includes free shipping. I think the name is kind of cool. Blisters help you grip things better, and thus, the novelty in the name, "mouseblister". This is not a bunch of motorcycle grips cut up and glued on. I said they were "inspired" by motorcycle grips. Yes, computer mice are slippery, unless you're spiderman with web fingers. Infomercial? hm.... an idea... j/k. Using a mouse all day long can sometimes have a bed effect on the movement of your hand, this is especially true during the winter, and it is also a sad fact that a mouse used all of the time is going to experience some wear and tear as well. That is where these MouseBlisters come in, they are stuck over the mouse to protect your wrist and preserve the mouse. Overall, it was a benign review from another blogger who hasn't actually tried the product. Big hands? Mouse Blister to the rescue! Are your hands too large to properly manhandle your computer mouse? Then the Mouse Blister is for you. Apart from the fact that it kind of makes your mouse look like it literally has blisters all over it (which is pretty cool, as a whole; no one else’s mouse is going to look like that) the Mouse Blister is supposed to help your large hands comfortably grip the mouse as comfortably as possible. And it gets even cooler – the Mouse Blister helps ease CTS (Carpal Tunnel Syndrome) and tendonitis symptoms that normally appear when you’ve used your mouse for FAR too long (gaming enthusiasts, hear any bells ringing yet?). How often do you find a neat mouse accessory that has all these amazing, health-improving benefits? This entry was posted on Wednesday, August 26th, 2009 at 3:31 pm and is filed under Computer Accessories. Aiya Inc. Copyright © 2008 Mouse Blister (TM) | 714-879-8882 | * 30 Day Satisfaction Guaranteed or your Money Back!